The death of Savita Halappanavar in Galway University Hospital on October 28th has re-ignited the smoldering abortion debate in Ireland. The 31-year-old woman died after her medically induced miscarriage went wrong and, despite repeatedly asking that the miscarriage be induced further to hasten its completion, it seems that this request may have been denied. 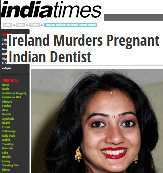 The death of Mrs. Halappanavar, who was a native of India, was reported in the ‘India Times’ newspaper under the headline: ‘Ireland Murders Pregnant Indian Dentist’. An investigation into the exact circumstance of her death is under way but regardless of its outcome the divisive issue of abortion is very much back on the Irish agenda. Abortion is as socially divisive in Ireland as it is in most countries. Abortion ‘on demand’ is illegal in Ireland, resulting in hundreds of women travelling to Britain every year for the procedure. The infamous ‘X’ case highlighted the inadequacies of Irish law two decades ago, dealing as it did with the issue of a 14-year-old girl who became pregnant after being raped. The Irish Supreme Court has already decided that a termination of a pregnancy is allowable once there is a specific risk to the life of the mother. Despite this successive Irish governments have failed to introduce legislation to clearly define when such abortions are permitted. Medical staff in hospitals are thus operating in a grey legal area with every case having its own unique set of circumstances. It is clear that the Irish government must finally act and introduce legislation immediately so that all parties to the debate know exactly where they stand. It is appalling though that it has taken the death of this woman to put the issue back on the agenda. Looks like there is going to be a rift in the coalition. Labour Party want this legislation done asap while many Fine Gale T.D.s are very conservative – could even bring down the government.